In this paper I investigate the emergence of new writing and reading practices under the impact of digital media. Examining Cayley's poetic work riverIsland , I focus on what the poet himself calls literal morphing. These transformations of letters constitute, I argue, an important shift in poetic writing whose importance for literary analysis must be acknowledged. I conclude that poetic works in programmable media lead to a rethinking of concepts of surface and depth in relation to writing. Emerging works of art and literature in networked and programmable media receive increasing attention within new media studies communities and other cognate contexts. However, a fewer number of scholars within more established disciplines, such as in my field, literary studies, are simultaneously pushing to include digital forms of literature into their realm of study. Questions arise, however, of how to study them, what concepts, methods, and theories to employ, and, ultimately, how one should define the necessary skills and training of scholars. I will touch upon some of these important and pressing issues in this paper by reading a digital poetic work, riverIsland, by acclaimed poet and scholar John Cayley. riverIsland by John Cayley and his collaborators is a digital poetic work made as a HyperCard standalone application (incorporating for instance QuickTime) for the Macintosh environment. 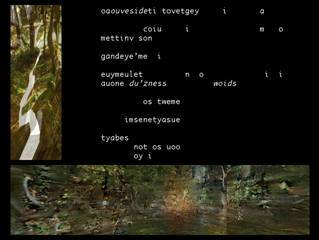 The work has been called codework, code poetry, or as in Cayley's introduction a navigable text movie with sound: the names seem to suggest that the work straddles disciplinary boundaries and definitions. By now riverIsland is quite known within new media studies as a poetic work (rather than a new media art work). While definitions such as these shed some light on the work, they cannot account for the complexity of the work's appearance, content, or the rich experiences it offers. Letters are given high prominence in Cayley's work in general (he has referred to his work as literal art) and this is also the case with riverIsland . 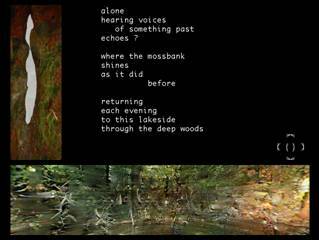 The work's main elements are poetic verses, images, sounds and recorded readings. The 32 verses drawn from a rich intertextual history are arranged in two loops, 16 on each loop, one vertical and one horizontal. The horizontal loop consists of 16 poems composed of Cayley's own adaptations of 16 of 20 quatrains of a sequence (Wang River Sequence) written by the 8 th century Chinese poet Wang Wei. The 16 verses on the vertical loop are all based on poem number five from Wei's sequence. The 16 variations include translations of Wei's poetry by Burton Watson, Gary Snyder, Arthur Cooper, François Cheng, and Octavio Paz. The work consists of verses in English, French, Spanish, and Chinese (in pinyin and Chinese characters). This bare-bone structure of highly intertwined texts with different histories, cultures, poetics, and from different languages and inscription systems is combined with images, sounds, recitations, and processes of morphing. I will the latter in more detail. What the reader meets, then, as he/she opens the work (after having installed it on a Macintosh with the right system requirements) is a mostly black screen with two images, a text, sounds of slowly moving water, and a male voice reading the text in the black central space (figure 1) . Figure 1 . The opening screen of riverIsland . The images seem to illustrate the title and the main figures in the poems, the forest and the river, while simultaneously serving as tools of navigation so that the reader can explore the two groups of poems. Spatially arranged, different poems are associated with different sections of the images (arranged in QuickTime). The horizontal image, constructed as a 360° loop, shows the blurry images of the forested banks of a river, and we can always hear the water, no matter where we are on this metaphoric island. The vertical image consists of several images imposed on each other changing from one to the next as the cursor slides across the surface. Unlike images in a printed book, then, these images have double functions as decoration/illustration and as a tool for navigation through the work's text nodes. My description so far implies several material differences between this multimedial work and, for instance, a printed work. Although William Carlos Williams's suggestion of viewing the poem as a small (or large) machine of words comes to mind as this work unfolds itself as a poetic event driven by the movement of the reader as they are coded by the machine, it is also quite clear that this machine's particular construction involves much more than words. The construction of riverIsland in programmable media has consequences for the perception of time and space, and the configuration of writing along these dimensions. This situation has led Katherine Hayles and others to argue that digital poems are events rather than objects . riverIsland manifests a poetic space that the reader explores by using the images and their functions as navigational tools to move from poem to poem. A particular sense of movement and the construction of an event are introduced in the work by a coded transformation of letters. Sliding across the images and stopping means stepping into another point on the loop, another poem's area. However, rather than instantly replacing one text with another, the reader encounters an intricate textual transformation between the starting and stopping points of the movement. The poems are nodal points between these moments of transformation, generated processes of change according to a set scheme. Cayley calls the processes literal morphing (figure 2). The morphing overtly points to the use of codeexecutable computer codeto create a truly dynamic poetic text on the screen's surface. going from one (static) text to another. It is a commonplace to mention that one of the particularities of programmable media is the separation between storage and surface. A printed text or a painting is simultaneously storage and presentation, whereas in programmable media the separation of surface and depth creates unique possibilities of dynamic poetic writing which not only changes the process of creation, but of reading as well . In riverIsland the algorithmically controlled textual morphing points to such technical facts and makes poetic use of them in a radical engagement with letters' malleable materiality. Although this paper is too short to allow space for an elucidation of the algorithm, in brief, it takes the letter as a minimal unit and step by step replaces the letters of a verse with other letters, signs, or spaces. This causes the seemingly static verse to transform through a number of different textual combinations until the process reaches its target text. In these moments, then, Cayley allows the emergent materiality of the signifierflickering, time-based [to create] a new relationship between media and content . During these moments of morphing the reader experiences a path not even/the pathmaker/knows, yet, paradoxically, the pathmaker/poet constructed the outline of the paths and leads us towards them . As Cayley, and his work, reminds us, mediation is text, not (just) paratext, and in riverIsland it is exposed and played with so that we may finally acknowledge it . Codeworkbroken or real, depth or surface? At this point, then, it makes sense to step off the island (as wonderful and seductively calm as it is) to briefly engage in scholarship about codework. Alan Sondheim, John Cayley, Katherine Hayles, Rita Raley, and Florian Cramer among others, have written about poetic and artistic work in programmable media which engage with, reference, and use computer code in different ways. The main point of divergence of opinions among critics has been the (actual as well as conceptual) difference between executable/working code and a metaphoric engagement with computer code at the surface of digital workssometimes called broken code. As both Sondheim and Cayley have pointed out, there are works which engage both forms of codework,' although they both stress the need for the qualitative difference to be acknowledged in theoretical discussions. Sondheim offers three categories of codework: (1) Works using the syntactical interplay of surface language, with reference to computer language and engagement, (2) Works in which submerged code has modified the surface languagewith the possible representation of the code as well, and (3) Works in which the submerged code is emergent content; these are both a deconstruction of the surface and of the dichotomy between the surface and the depth . While Cayley acknowledges practices of code outside of computer technology, to avoid confusion when talking about practices of code within computer technology, he suggests at least five ways in which the term code can be used. The last of these five defines code as that which runs (in time), generating or modulating the writing of which it is an intrinsic or necessary part . riverIsland can be seen as an example of this type of codework. One could indeed argue that the main point of riverIsland is to expose this difference in a poetic setting. This begs the question, why? In riverIsland , Cayley uses his algorithmic morphing to transform the materiality of letters and radically address the changed situation of writing in programmable media. The work also exposes the Western alphanumeric preference inherent in today's computer technology by contrasting Chinese and Western languages. This raises a number of interesting issues (which this paper can merely reference); one of the more urgent issues concerns the nature of translation and the socio-historic context of computer technology as developed in Western culture and with Western alphanumeric sign systems and philosophical logic as its basis . So far, I have described riverIsland 's construction and some of the issues it raises for the understanding of the work. Within Humanities and Arts disciplines issues of meaning and composition structure (as well as cultural and historical contexts) are deemed scholarly interesting. In the case of digital poetic works these issues need to be put in relation to the underlying computer structure itself; it is a question of materiality matters. We are all familiar with the literary theories of content/structure and its philosophical counterparts. In the case of discussion about digital works, the question of how it means, how the work is constructed, has taken prominence over discussions of what those constructions may signify. Since work in programmable media cast a different relationship between content/structure, questions of formalism have been and are importantbut it is equally important to address issues of meaning as well. I have concentrated on one experience of riverIsland to tease out some of the possible meanings of the work. Obviously, riverIsland as poetic event involves multiple sights and sounds. As with many digital works, the process of reading must be discovered as one experiences the individual work. While we by now know and can handle some of the conventions within programmable media, such as hyperlinks, mouse-overs and scrolling, new manners of engaging with the media are explored in digital works. The poets are guided by the applications and programming languages they use, and the works they create are consequently delineated by the combination of the poets' skills and particular use of the materials and the materials' properties . Cayley, commenting on his work as a poet, says, Meaning creation and signification as performance are at the heart of a poet's work. New ways of performing and generatingand new ways of understanding these activitiesare always of practical interest to the poetic writer, especially where such developments have potential for aesthetic, social, and political affect . I would add that these new ways of understanding poetic activities and practices in programmable media are highly interesting for literary scholars as well. The 32 verses of riverIsland offer a meditation on, and mediation of, the complex relationships between human beings and nature. The content of the work echoes a long history of these relationships while the form points to the current and latest configuration of humans and their technologies. The verses are thus a meditation on and an instantiation of the equally complex relationships between the human being (poet, reader) and the machine (hardware, software). The literal morphingstextual transformationsask questions about what we are seeing and how we are reading when we view the screen. I would argue that this practice of revealing the code is comparable to what has been termed postmodern self-reflexive practices (as well as an engagement in the nature-s of letters in different media). When the verses are static, we immerse ourselves in the river/forest/island world that is conjured up by sounds, images, and the words we read . On one level, then, the work invites the reader to step into the river and slowly float from one part of the work to the next (which Hayles sees as the producing of time as a flow ). The sounds of voices reading verses (some hardly audible as if (over)heard from far away, others clear and close) and the ubiquitous sound of running water creates a sonic landscape accompanied by the visual. What screenshots never show (as in this paper) is how the poetic space is created not just by textual and rhetorical means, but through the density of sound and the constant interplay of images, words, and the reader's movements setting off literal morphings. Readers do not just read a poem; they experience riverIsland by hearing river water flowing, voices speaking; yet this also makes readers aware of that the computer is producing the event. Sound works here as a reminder of the underlying structure of the working machine generating this experience. This is one aspect of self-reflexive strategies in riverIsland . I have argued elsewhere  that riverIsland functions as a metatext, simultaneously engaging with a rich intertextual and contextual poetic history from the Chinese 8 th century poet Wang Wei onwards, and with the current programmatologically mediated poetic translation/transliteration that Cayley is concerned with. As metatext, then, riverIsland comments upon (and produces meaning about) certain facets of our (Western) cultural moment in what has been termed the information, or digital, age, such as the nature of translation, the increasing incorporation of computer technology and its effects on society and so forth. One of the most crucial aspects of, in this case, poetry in new instantiations in programmable media is the understanding of the leveled differences between surface and depth inherent in the technology as it is constructed today. The processes in the computer produce different results/outcomes, only some of which are discernable on the surface level. As scholars dealing with literary artifacts we are used to addressing the surface level only; now, works in programmable media forces us to acknowledge and address multimedial and procedural facets of literary creation as well. In the case of riverIsland and many other interesting artistic and literary works emergingthe poet is programming, and taking this path makes all the difference. This paper has been previously published in the DAC 2005 proceedings (short papers). The work is now available in version 2.4.2. Naturally, the particular situation of system requirements, having the right computer, the right software et cetera raises a number of questions about digital works and their distribution, perception and so forth. It is, however, important to note that this does not mean that content and form are separable in programmable media. Although these might be thought of as separate entities conceptually; in effect, they cannot be. Cayley, John. The Code Is Not the Text (Unless It Is the Text). Electronic Book Review. http://www.electronicbookreview.com/v3/servlet/ebr?command=view_essay&essay_id=cayleyele, 2002. Perhaps it is more appropriate to say the poet creates the possibilities for the paths; the environment in which the reader's experience conjures his or her own path from a set number of possible paths. Of course, some scholars and authors have always known this. Among scholars we can note Jerome McGann's work within literary studies and textual criticism, Jay Bolter in media studies, and a range of scholars such as Marjorie Perloff and Brian McHale in studies of modern and postmodern literature, specifically poetry. Another issue is that of the relationship between the letter (the printed, written, spoken, or computerized') and the image (pixelized or not). One effect of seeing these literal transformations for the reader, or at least for this reader, is the realization that the so called visual turn we are said to live in needs to be qualified with the acknowledgment of the alphanumeric prominence in digital media. John Cayley has written about this in Literal Art: Neither Lines nor Pixels but Letters, in First Person: New Media as Story, Performance, and Game . Eds. Noah Wardrip-Fruin and Pat Harrigan, MIT Press, Cambridge, Mass, 2004. The question of materiality is readdressed in programmable media, but is, and always was, present although largely ignored by for instance the literary academic community. As Bolter, McGann, and many others in different disciplines have reminded us: print technologies and the ways in which most of us were taught to think about printed texts blinded us to texts' (different kinds of) materiality, leading us to consider merely the text as meaningful content without (significant) form. In another context, this oscillation between immediacy and hypermediacy, or awareness of mediation, has been discussed at length by Jay Bolter and Richard Grusin ( Remediation: Understanding Media , MIT Press, Cambridge, Mass, 1999). Hayles, Katherine N. The Time of Digital Poetry: From Object to Event. Forthcoming in New Media Poetry: Aesthetics, Institutions, Audiences , Thomas Swiss and Dee Morris, editors, MIT Press, Cambridge , Mass. Engberg, Maria. riverIsland och digital poesi. Elektroei: nya medier, teknicitet, digital poesi, 22/23, 2005.